Ready to run, complete package with hardware and software. 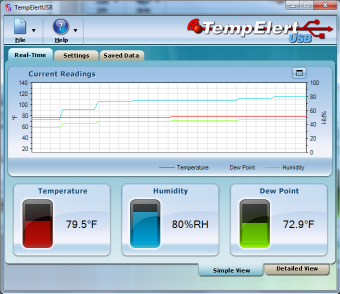 TempElert USB will send email, pager, cellphone alerts in temperature, humidity, and dewpoint over/under conditions which you set. Runs in the background on any Windows XP or newer PC or server. Fully configurable, multiple recipients, and offers a free PC shutdown program you can run remotely if you need to shutdown your server room. Useful also for monitoring refrigeration systems, HVAC, greenhouses, wine cellars, or any situation where temperature and humidity out of safe range can cause you problems. Simple 1 minute install, plugs into a spare USB port on your PC and can be extended with optional extension cables including over CAT5 Ethernet cable. Set and forget with peace of mind knowing you will be alerted if things get too hot, cold, dry, or wet.